Deploying solar power at the scale needed to alleviate climate change will pose serious challenges for today’s electric power system, finds a study performed by MIT and IIT-Comillas University. For example, local power networks will need to handle both incoming and outgoing flows of electricity. Rapid changes in photovoltaic (PV) output as the sun comes and goes will require running expensive power plants that can respond quickly to changes in demand. Costs will rise, yet market prices paid to owners of PV systems will decline as more PV systems come online, rendering more PV investment unprofitable at market prices. The study concludes that ensuring an economic, reliable, and climate-friendly power system in the future will require strengthening existing equipment, modifying regulations and pricing, and developing critical technologies, including low-cost, large-scale energy storage devices that can smooth out delivery of PV-generated electricity. Most experts agree that solar power must be a critical component of any long-term plan to address climate change. By 2050, a major fraction of the world’s power should come from solar sources. However, analyses performed as part of the MIT Future of Solar Energy study found that getting there won’t be straightforward. “One of the big messages of the solar study is that the power system has to get ready for very high levels of solar PV generation,” says Ignacio Pérez-Arriaga, a visiting professor at the MIT Sloan School of Management from IIT-Comillas University in Madrid, Spain. Without the ability to store energy, all solar (and wind) power devices are intermittent sources of electricity. When the sun is shining, electricity produced by PVs flows into the power system, and other power plants can be turned down or off because their generation isn’t needed. When the sunshine goes away, those other plants must come back online to meet demand. That scenario poses two problems. First, PVs send electricity into a system that was designed to deliver it, not receive it. And second, their behavior requires other power plants to operate in ways that may be difficult or even impossible. The result is that solar PVs can have profound, sometimes unexpected impacts on operations, future investments, costs, and prices on both distribution systems—the local networks that deliver electricity to consumers—and bulk power systems—the large interconnected systems made up of generation and transmission facilities. And those impacts grow as the solar presence increases. To examine impacts on distribution networks, the researchers used the Reference Network Model (RNM), which was developed at IIT-Comillas and simulates the design and operation of distribution networks that transfer electricity from high-voltage transmission systems to all final consumers. Using the RNM, the researchers built—via simulation—several prototype networks and then ran multiple simulations based on different assumptions, including varying amounts of PV generation. In some situations, the addition of dispersed PV systems reduces the distance electricity must travel along power lines, so less is lost in transit and costs go down. But as the PV energy share grows, that benefit is eclipsed by the need to invest in reinforcing or modifying the existing network to handle two-way power flows. Changes could include installing larger transformers, thicker wires, and new voltage regulators or even reconfiguring the network, but the net result is added cost to protect both equipment and quality of service. The figure below presents sample results showing the impact of solar generation on network costs in the United States and in Europe. The outcomes differ, reflecting differences in the countries’ voltages, network configurations, and so on. But in both cases, costs increase as the PV energy share increases from 0 to 30%, and the impact is greater when demand is dominated by residential rather than commercial or industrial customers. 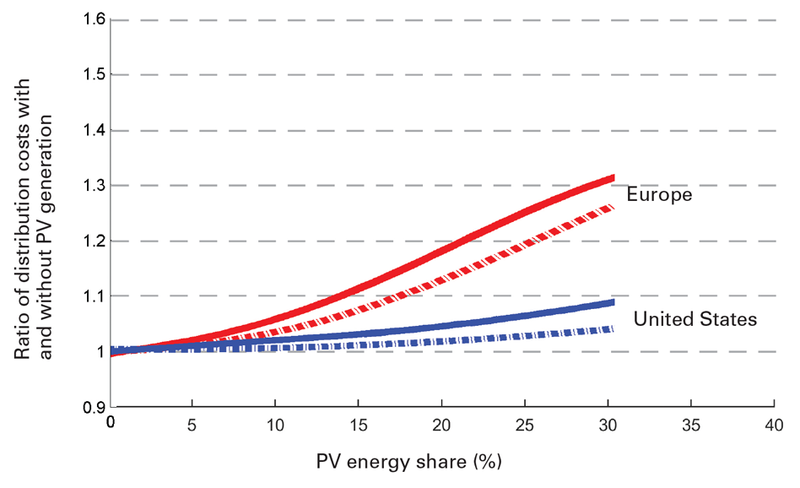 These curves show the impact of solar generation on distribution network costs in the United States (blue) and in Europe (red). (Results differ in part due to differing network configurations and voltages.) Costs are measured relative to the cost of a corresponding no-PV scenario. Energy storage is assumed to be unavailable. Solid lines indicate 80% residential, 15% commercial, and 5% industrial demand. Dashed lines indicate 15% residential, 80% commercial, and 5% industrial demand. In all cases, costs increase as PV energy share increases, with the greater impact seen when residential customers dominate demand. The impact is also greater in less sunny regions. Indeed, in areas with low insolation, distribution costs may nearly double when the PV contribution exceeds one-third of annual load. The reason: When insolation is low, many more solar generating devices must be installed to meet a given level of demand, and the network needs to be ready to handle all the electricity flowing from those devices on the occasional sunny day. Another concern stems from methods used to calculate consumer bills—methods that some distribution companies and customers deem unfair. Most US states employ a practice called net metering. Each PV owner is equipped with an electric meter that turns one way when the household is pulling electricity in from the network and the other when it’s sending excess electricity out. Reading the meter each month therefore gives net consumption or (possibly) net production, and the owner is billed or paid accordingly. Most electricity bills consist of a small fixed component and a variable component that is proportional to the energy consumed during the time period considered. Net metering can have the effect of reducing, canceling, or even turning the variable component into a negative value. As a result, users with PV panels avoid paying most of the network costs—even though they are using the network and (as explained above) may actually be pushing up network costs. “The cost of the network has to be recovered, so people who don’t own solar PV panels on their rooftops have to pay what the PV owners don’t pay,” explains Pérez-Arriaga. In effect, the PV owners are receiving a subsidy that’s paid by the non-PV owners. Unless the design of network charges is modified, the current controversy over electricity bills will intensify as residential solar penetration increases. 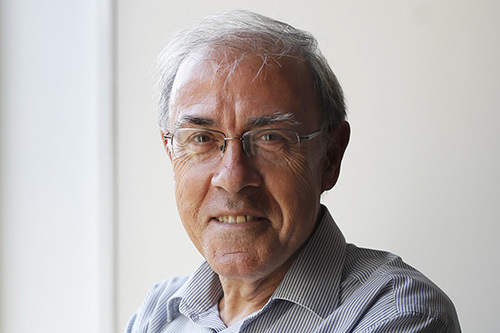 Therefore, Pérez-Arriaga and his colleagues are developing proposals for “completely overhauling the way in which the network tariffs are designed so that network costs are allocated to the entities that cause them,” he says. In other work, the researchers focused on the impact of PV penetration on larger-scale electric systems. Using the Low Emissions Electricity Market Analysis model—another tool developed at IIT-Comillas—they examined how operations on bulk power systems, the future generation mix, and prices on wholesale electricity markets might evolve as the PV energy share grows. Unlike deploying a conventional power plant, installing a solar PV system requires no time-consuming approval and construction processes. “If the regulator gives some attractive incentive to solar, you can just remove the potatoes in your potato field and put in solar panels,” says Pérez-Arriaga. As a result, significant solar generation can appear on a bulk power system within a few months. With no time to adjust, system operators must carry on using existing equipment and methods of deploying it to meet the needs of customers. A typical bulk power system includes a variety of power plants with differing costs and characteristics. Conventional coal and nuclear plants are inexpensive to run (though expensive to build), but they don’t switch on and off easily or turn up and down quickly. Plants fired by natural gas are more expensive to run (and less expensive to build), but they’re also more flexible. In general, demand is met by dispatching the least expensive plants first and then turning to more expensive and flexible plants as needed. For one series of simulations, the researchers focused on a power system similar to the one that services much of Texas. Results presented below show how PV generation affects demand on that system over the course of a summer day. In each diagram, yellow areas are demand met by PV generation, and brown areas are “net demand,” that is, remaining demand that must be met by other power plants. Left to right, the diagrams show increasing PV penetration. Initially, PV generation simply reduces net demand during the middle of the day. But when the PV energy share reaches 58%, the solar generation pushes down net demand dramatically, such that when the sun goes down, other generators must go from low to high production in a short period of time. Since low-cost coal and nuclear plants can’t ramp up quickly, more expensive gas-fired plants must cut in to do the job. These diagrams show how PV generation affects the demand that must be met by other generating units on a summer day on a Texas-like power system. Yellow areas are demand met by PV generation; brown areas are “net demand” that must be met by other power plants. 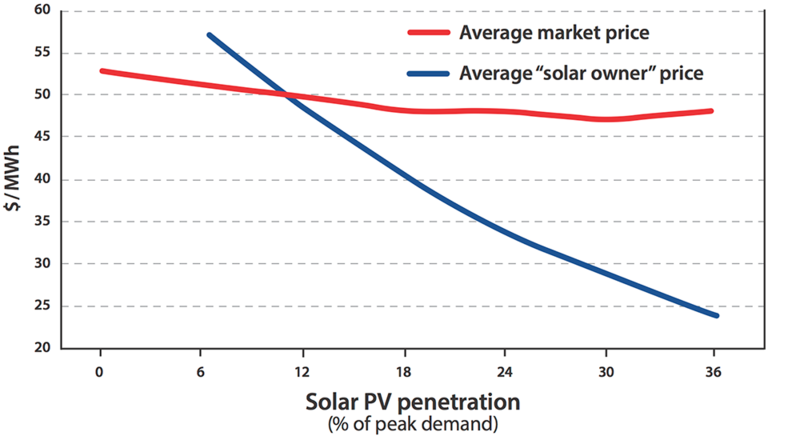 When PV penetration is low, net demand is simply reduced during the middle of the day. But as the PV energy share grows, net demand is far lower during the sunny part of the day and then must ramp up quickly when the sun goes down—a rapid change that can be handled only by expensive gas-fired power plants. Interestingly, as PV penetration grows, the peak in net demand shifts in time but never decreases appreciably. As a result, meeting the net-demand peak will require the same installed non-PV generating capacity in each case, but that capacity will be used less as PV generation increases. That change has a major impact on prices on the wholesale electricity market. Each owner who sends a unit of electricity into the bulk power system at a given time gets paid the same amount: the cost of producing a unit of electricity at the last plant that was turned on, thus the most expensive one. So when PVs come online, expensive gas-fired plants shut off, and the price paid to everyone drops. Then when the sun goes away and PV production abruptly disappears, gas-fired plants are turned back on and the price goes way up. As a result, when PV systems are operating and PV penetrations are high, prices are low, and when they shut down, prices are high. Owners of PV systems thus receive the low prices and never the high. Moreover, their reimbursement declines as more solar power comes online, as shown by the downward sloping blue curve in the figure below. These curves show average daily prices on the wholesale markets as the fraction of PV energy grows to 36% of all peak demand. The red curve shows average market price—the price perceived by a generator functioning at constant output all the time—while the blue curve shows the price seen by PV owners. Average market price doesn’t change significantly with increasing PV penetration because the PV systems reduce prices when they’re running and increase prices when they’re not. But the price paid to PV owners drops dramatically. At some level of PV penetration, further investment in PV systems will no longer be profitable. However, if goals and incentives are set for certain levels of solar penetration decades ahead, then PV investment will continue, and the bulk power system will have time to adjust. In the absence of energy storage, the power plants accompanying solar will for the most part be gas-fired units that can follow rapid changes in demand. Conventional coal and nuclear plants will play a diminishing role—unless new, more flexible versions of those technologies are designed and deployed (along with carbon capture and storage for the coal plants). If high subsidies are paid to PV generators or if PV cost diminishes substantially, conventional coal and nuclear plants will be pushed out even more, and more flexible gas plants will be needed to cover the gap, leading to a different generation mix that is well-adapted for coexisting with solar. A powerful means of alleviating cost and operating issues associated with PVs on bulk power systems—as on distribution networks—is to add energy storage. Technologies that provide many hours of storage—such as grid-scale batteries and hydroelectric plants with large reservoirs—will increase the value of PV. “Storage helps solar PVs have more value because it is able to bring solar-generated electricity to times when sunshine is not there, so to times when prices are high,” says Pérez-Arriaga. As the figure below demonstrates, adding storage makes investments in PV generation more profitable at any level of solar penetration, and in general the greater the storage capacity, the greater the upward pressure on revenues paid to owners. This diagram shows results from simulating the operation of a Texas-like power system while changing three factors: the penetration of PV as a fraction of peak demand, the income per installed watt seen by owners of PV systems, and energy storage capacity on the system. In the absence of storage, as PV penetration increases, PV system owners’ income decreases. But at each level of solar PV penetration, the addition of storage increases that income, and in general, the more storage added, the greater the upward shift. Energy storage thus can play a critical role in ensuring financial rewards to prospective buyers of PV systems so that the share of generation provided by PVs can continue to grow—without serious penalties in terms of operations and economics. Again, the research results demonstrate that developing low-cost energy storage technology is a key enabler for the successful deployment of solar PV power at a scale needed to address climate change in the coming decades. J.D. Jenkins and I. Pérez-Arriaga. The Remuneration Challenge: New Solutions for the Regulation of Electricity Distribution Utilities Under High Penetration of Distributed Energy Resources and Smart Grid Technologies. MIT Center for Energy and Environmental Policy Working Paper no. WP 2014-005, September 2014. MIT Energy Initiative. The Future of Solar Energy: An Interdisciplinary MIT Study. Chapter 7: “Integration of Distributed Photovoltaic Generators,” and Chapter 8: “Integration of Solar Generation in Wholesale Electricity Markets.” 2015. I. Pérez-Arriaga and A. Bharatkuman. A Framework for Redesigning Distribution Network Use-of-System Charges Under High Penetration of Distributed Energy Resources: New Principles for New Problems. MIT Center for Energy and Environmental Policy Working Paper no. WP 2014-006, October 2014.